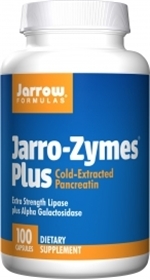 Jarro-Zymes Plus contains porcine pancreatic enzymes because their composition is similar to that of human pancreatic enzymes and are superior to vegetable enzymes. Alpha galactosidase is produced by single cell fermentation and facilitates digestion of legumes. Porcine pancreas contains a complex of natural enzymes including Protease, Amylase, Lipase, Trypsin, Chymotrypsin, Esterase, Peptidase, Nuclease, Elastase, Collagenase. Take 1 to 3 capsules with each meal, or as directed by your qualified health care consultant. DO NOT chew this product. Swallow quickly with a full glass of liquid. Rice flour, magnesium stearate (vegetable source) and silicon dioxide. Capsule consists of gelatin.